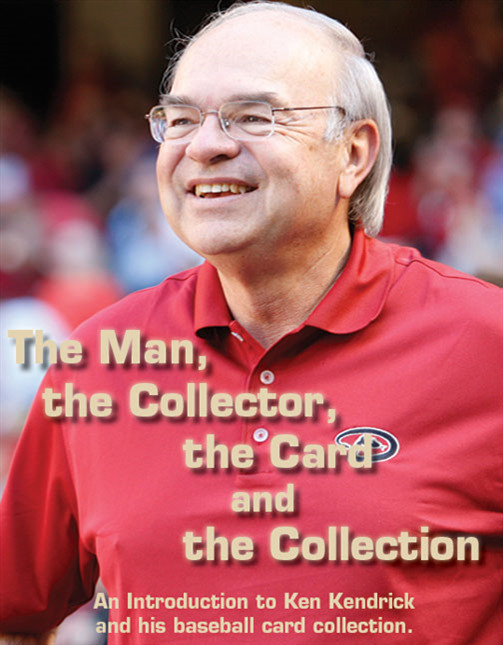 In some ways, it is a story that has similarities to hundreds of others you have read in "Sports Market Report" – a young boy becomes enamored with collecting baseball cards, loses interest during his late teens and early twenties, and then, after becoming a successful businessman, returns to card collecting with a renewed passion that inspires him to put together a great collection, and present it in a prestigious way. There are, however, elements of this story that make it unique and unlike any you have ever read before. The first thing that makes this story different is the collection – one of the most elite amassments of the world's most coveted cards in the highest grades known to exist. The second thing is the inclusion of the card – the PSA NM-MT 8 Honus Wagner T206 – revered as the most desirable card in the hobby. The third thing is the current venue in which the collection is being displayed – the Baseball Hall of Fame. And, the final thing that sets this story apart is the collector himself – the man – Arizona Diamondbacks owner Ken Kendrick. Born in Princeton, West Virginia, Earl "Ken" Kendrick Jr. had an early fascination with sports. "When I was very young, we didn't have a television, so my early identity with big time or professional sports was listening on the radio," said Ken. "When I was very young, I was a fan of the Brooklyn Dodgers and one of my fondest early memories was when I was 11-years old and the Dodgers won the 1955 World Series. But then, soon after that, they went to California. When you lived in the east, you just couldn't keep up with a west coast team, so my loyalties then shifted from the Dodgers to the team my father rooted for – the Cincinnati Reds. He was a fan of the Reds because Cincinnati was the largest city closest to our home." Along with listening to the action of his favorite teams on the radio, Ken also got into the action himself by participating in his local Little League program. While never an outstanding athlete, Ken's competitive spirit carried him from the ranks of Little League to making his high school basketball, baseball and football teams. That athletic involvement continued when he matriculated at West Virginia University. "In college, I was very active in intramurals," said Ken "There was a very strong intramural system, and I played various sports on that level. But, as far as university play, West Virginia was division one, and I just wasn't talented enough to compete on that level." 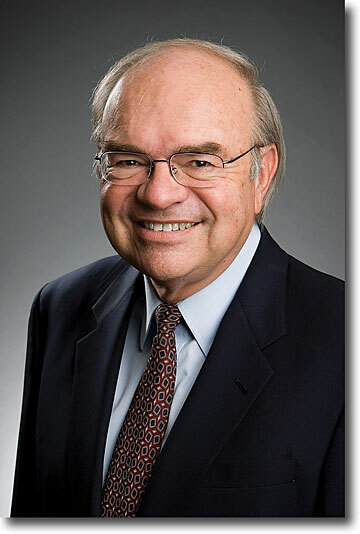 After receiving a degree in business administration in 1965, Ken was offered his first job, with IBM in Baltimore. "After working at IBM for three years, I left to start my own software company that became the cornerstone of my business career," said Ken. "I was very fortunate to have gotten into that business before the word software had even been coined. That was the era of the big mainframe computer. There were no personal computers, and software was not a business. When I started my company, other business were just beginning to emerge around building software. So, that is what I ended up doing, and thankfully it worked." So, how does a successful software company founder become the owner of a Major League Baseball team? Ken said it wasn't exactly a plan, but rather a serendipitous progression that led him to the executive office of the Diamondbacks. "In 1990, I gave up day-to-day management of my software company, although I continued to own the company," said Ken. "By that time, I had developed a really strong management team and I wanted them to have a chance in running the company. The problem with that was, I'm a high-energy guy, and when I'm into something, I'm really into it. The only way I could give up the day-to-day running of the company was to get out of town. So, my wife and I decided we would leave Virginia, where the company was located, and we moved to Arizona. That way I was far enough away so that I would not be tempted to be constantly sticking my nose into what was going on at the company on a daily basis." After settling in Arizona, Ken became involved in a few companies as a substantive investor including the Phoenix Suns Basketball team. "I happened to move into a neighborhood where my next-door neighbor was involved with the Suns," said Ken. "A new ownership had recently been formed, and I was invited to become a limited partner in the ownership of the Suns. I thought it would be fun. I had always been an avid sports fan and I thought it would be great – going to the games and all." Within a couple of years, another opportunity arose for Ken when Phoenix was in contention to be awarded a Major League Baseball franchise. "Jerry Colangelo who was the managing partner of the Suns took the lead on putting together a potential ownership group for a baseball team," explained Ken. "So, being as that I was one of his partners in the Suns, he came to me to see if I would be interested in engaging in that, and I was." In the late-1990s, the dream of Major League ball being played in The Valley of the Sun became a reality when the Arizona Diamondbacks were born. "At first, I was a limited partner with no active role in the team," said Ken. 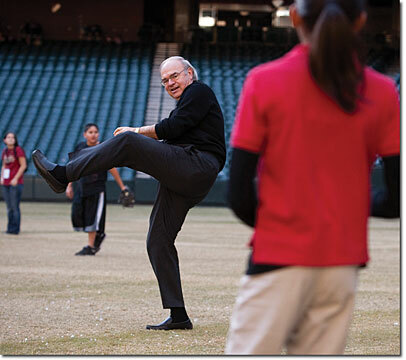 "But over the next few years, there were some financial stresses that hit the Diamondbacks. The team had been very successful on the field, but not so successful behind the scenes. So, I was approached to take a greater role from 2002 to 2004. It was during that time that I restructured the ownership group and became one of the managing partners, and I've been doing that ever since." Today, Ken, his wife of 30-years, Randy, and their two children, 14-year old Cal and Catie, make their home in Paradise Valley, Arizona. Ken and Randy are devoted to numerous charitable organizations including many that provide services to children throughout Arizona. "We are very actively engaged and involved in our community," said Ken. "That is something I enjoy doing, and have the good fortune to be able to do. On the home front, we are very involved with our kids and their activities. Cal and Catie are in ninth grade and they are the central focus of our lives. Because of their school and activities, we travel less than we once did, but we have a home in Colorado that we go to in the summer. My kids are avid skiers and, while I'm not, I do play golf and my son is also a golfer." The greatest professional athletes to have ever swung a bat, thrown a left jab, sunk a rimless three-pointer, or pulled in a game-winning touchdown pass all started somewhere – and the same is true with the greatest card collectors. "As a kid, just like all my buddies, I collected baseball cards," said Ken. "I started collecting when I was eight, in 1952. My buddies and I would go to the local five-and-ten-cents store and buy a pack of cards, open them up, chew the gum and go through the cards. The timing certainly played a factor in my interest in card collecting. The 1952 Topps set had just come out. They were the most wonderful cards ever made, and today, they are some of the most treasured that have been produced in the last 60 or 70 years." Ken went on to say that while it was typical for kids to collect baseball cards during that time, as the years went by, he received a benefit that eluded most kid collectors. "I had the great fortune of having a mother who kept my cards for me," he said with a laugh. "Everybody wants to know who the guy was whose mother didn't throw away his cards? – I'm that guy! The other good fortune I had was that I have a brother who is five years younger than me. As with most kids who collect cards, I got to a point where I got interested in other things, and when I did, my brother picked up where I left off and collected for another few years – and my mother kept his cards too! So the collection was larger than had it just been mine, and it was preserved by our mother." Ken is actively engaged and involved in his community. "That is something I enjoy doing and have the good fortune to be able to do," he said. A builder of sets from the time he was young, Ken said that he still has every single card he ever collected as a kid. "I had thousands and thousands of cards, and that was really what inspired me to transition into being an adult collector," said Ken. In1990, Ken went to visit his mother who reminded him of all the cards she had stored away. "I knew they were there, and I knew that collecting had become a fast-growing activity in which values were growing dramatically," Ken recalled. "So, I arranged to have them sent out to Arizona where I was living and when I got them, I began going through them and cataloging what I had. As I went through the price guides, I began to realize that I had some real treasures from that 1952 to 1960 era. That got me inspired to start filling the holes in some of my sets and, to do that, I started going to card stores. My goal was to complete my sets, which I have done. I now have 25-years worth of sets completed well into 1977 and 1978. I have every card Topps produced during that era, and I also have some Bowman sets. I wanted to complete the sets, and then once I did, I wanted to complete sets of a better quality. I was at a different level as far as my capacity to invest money, and that's when I got interested in not just upgrading my sets, but also in putting together an elite collection." Ken said that as an adult collector with the financial wherewithal to compile important sets in high quality, grading has been invaluable. "When I was a kid, there were no authentication companies around," he said. "When I was buying cards, even as an adult in the early 1990s, they were not authenticated or graded, and it was up to you to inspect them as well as you possibly could. But, you never knew with any confidence what you were buying and (if) someone may be scamming you. Now, as someone who has an investment of substantial dollars, I would never think of acquiring a card that had not been authenticated and graded. PSA has become the ultimate deciders on giving official identify and value to a card. They provide a great service." Today, with multiple sets from the early-1950s through the late-1970s, Ken attributes the incredible volume of his collection to one simple fact – "I have never been involved in the sale of cards," he said with a laugh. "I have never sold a card in my entire life – not a single one." As far as his collecting bug, Ken said it both begins and ends with cards. "I don't collect anything besides cards," he said with a chuckle. "I have quite a few baseballs signed by Hall of Fame players that I know personally. I also have some nice photos with legendary athletes – Hank Aaron and Willie Mays and Muhammad Ali. But, I don't really consider those things to be a collection." Pointedly asked if he has a favorite card in his collection, Ken does what most high-end collectors do – he bites his tongue in an attempt to refrain from saying he just loves them all. "If you were to pin me down – as someone who had been a Brooklyn Dodgers fan as a kid – I have a Sandy Koufax rookie card that is very special to me," he said. "I love all cards of the Dodgers players cards from 1955 and '56. Those players were my heroes when I was a kid. I also love the cards of the Cincinnati Reds players who were also my heroes when I was a youngster." Incredibly, while being pressed on his favorites, he doesn't mention the card until he is specifically asked about it. When he is, he becomes a bit sheepish. Ken said his cards represent an emotional attachment to his youth, and a competitive success as an adult. "I was very proud to get it, and I'm very proud to own it, because I know what it means to the hobby and the collecting world," he said modestly. "Before I owned that card, I had already put together an extremely elite collection and this is, of course, the ultimate card in the hobby." Once owned by former Los Angeles Kings owner Bruce McNall and hockey superstar Wayne Gretzky, the PSA NM-MT 8 T206 Honus Wagner was eventually sold to a Chicago collector Michael Gidwitz, who in turn, auctioned it in 2000 and it sold for $1.265-million to Collector Brian Seigel. In 2007, Seigel sold the card to an anonymous collector for $2.35 million. It was then sold to Kendrick for $2.8 million – the highest price ever paid for a card. Referencing Joe Orlando's book Top 200 Sportscards: An In-Depth Guide for the Card Collector, Ken pointed out that he owns every one of the top 10 cards in the highest grades known to exist. "For a guy who collects on my level, it was always a goal to get the Honus Wagner card into my collection," he said matter-of-factly. Having been offered the opportunity to acquire the Wagner card through the combined efforts of David Kohler at SCP and J. P. Cohen at Memory Lane, Ken said that when he became the official owner of the most revered card in the hobby, he simply felt that it completed his elite grouping. "I've always been pretty low-key about purchasing the card," he said. When asked if he could share any further insight on what it is like to own the card, he gave an answer that revealed his love of family more than his love of collecting. "The proudest moment I have had with that card came when I brought it home for the first time and showed it to my children," Ken said. "They were just 10-years old at the time and they, of course, knew I was a card collector. I wanted them to see it, and I told them of all my cards this was the most important card, not just in my collection, but in the entire hobby. They didn't really identify with dollars, but they knew it was important. I told them that one day it would belong to them and that they would be very proud to be the owners of this card. End of discussion. Then, a couple hours later, my son came up to me and asked if he could talk to me. He said: "Ya know that card you showed us? I just want you to know, I would never sell it.' That tells my story," said Ken. "These cards are a legacy for me. I identify with the sport of baseball – have been since I played on my first Little League team when I was eight-years old. The game has always been important to me throughout my entire life. But more so, the family element is important to me. Being able to pass something down to my children that is of great importance to the history of the game – that really means a lot to me." While most extremely high-end collectors keep their cards squirreled away in safety deposit boxes, others have created elaborate display cases to show off their collection. As for where Ken's most valuable cards are housed – well, for pure prestige you just can't beat having your collection exhibited at the Baseball Hall of Fame in Cooperstown, New York. "It is an honor to have the Baseball Hall of Fame showcase my collection," said Ken. "It was always my intention to share these cards with baseball fans, and what better place to do that than in Cooperstown." 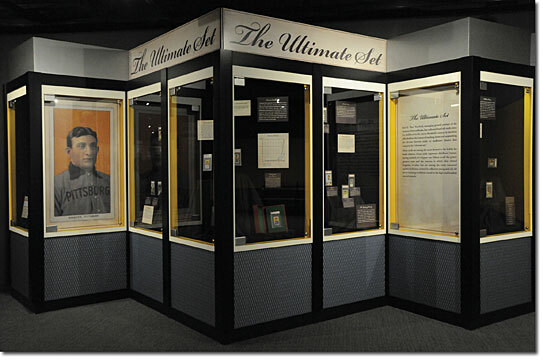 The temporary exhibit, housed on the hall's second floor, is titled The Ultimate Set. It features 25 of the most important cards in the hobby, and is divided into five sections: Childhood Heroes of the 1950s, The Mystery of Scarcity, Classic Cardboard, Design Appeal, and A Piece of History. The Ultimate Set that features 25 of the most important cards in the hobby is now on display at the Hall of Fame. Photo by Milo Stewart Jr./National Baseball Hall of Fame and Museum. The Childhood Heroes exhibit highlights the cards Ken collected as a kid. The Mystery of Scarcity presents some of the rarest cards known to exist including the 1954 Bowman Ted Williams card that was pulled from distribution after Williams signed an exclusive deal with Topps. Another card on display in the scarcity section is the infamous number 106 card from the 1933 Goudey set. As many collectors know, Goudey never released a card numbered 106 in that offering. It was widely speculated that the company did that purposely to keep collectors buying packs in hopes of finding the card. When collectors figured out that #106 was never produced, the company suffered a public relations nightmare and went onto what is today known as "damage control." The following year, they released a special card numbered 106 that, for reasons seemingly apropos of nothing, pictured Nap Lajoie, a Philadelphia A's second baseman who, by that time, had been retired for 18 years. The Design Appeal section of the exhibit includes cards that are revered for their exceptional eye appeal including beautiful examples from the much-loved Cracker Jack set. Presented under the A Piece of History banner, collectors will see cards that commemorate the game's historic record-breakers including Babe Ruth, Joe DiMaggio and Jackie Robinson. The most popular exhibit is the Classic Cardboard display that gives collectors the rare opportunity to get within feet of the T206 Wagner card. "Ken has chosen this time to share his collection with baseball fans, and we could not be more pleased and thankful," said Hall of Fame President Jeff Idelson. "There's no better place than the Hall of Fame in Cooperstown to feature a collection of such prestige and reverence. We are honored to share his treasures with visitors on their pilgrimage, as The Ultimate Set is the perfect multi-generational museum exhibit." 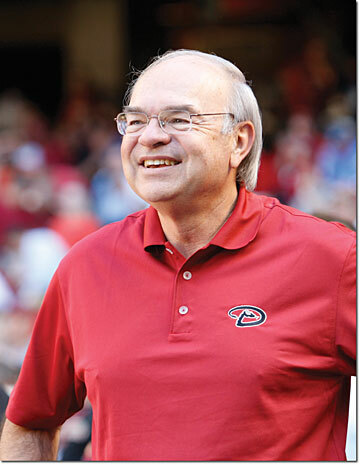 It is anticipated that Ken's card collection will continue to be exhibited at the Hall of Fame through 2011, with future plans of a permanent display at the Arizona Diamondbacks' home field. "I know these cards represent an important part of the heritage of our game," said Ken. "When the people from the Hall of Fame approached me and asked if I would be willing to place them on display, I agreed to do it because it gives people the chance to see this elite collection." Asked to summarize what it means to own this magnificent collection, Ken became reflective. "The cards that I have from my youth have a meaning that takes me back to a time and a place I always want to remember," he said thoughtfully. "They are a tangible memory of where I came from – my life, my friends, and the games we played with those cards. The cards I have acquired in my later years, from the mid-1990s to present, of course also have a great importance, but they don't have the same emotional attachment. I'm proud to have this high-caliber collection. I'm a completive guy. I wouldn't be doing what I do if I wasn't a competitive person, so I have been competitive with other collectors to make my collection the best of its type. Don't get me wrong, there are other folks out there who have extraordinary collections. But, if you look at the top 20 most desirable cards, and look at the grading of my top 20 cards, I can say that this collection is the best one that exists in the world. So, to me, my cards represent an emotional attachment to the cards from my youth, and a competitive success as an adult."